Since we were first curious to see how the new Optoma DLP 4K TI chip projectors compared to native 4K projectors we have received many questions, comments, and requests for more comparisons. There are now many reviews, “first looks,” and technical evaluations of both the new Sony and Optoma projectors that can be found on-line. However, the one question that seems to keep coming up is how do they compare? The answer to that question is actually quite complex as there are so many variables and feature differences that may be critical to one person, and not even apply to another. Features like 3D, gaming response time, and motorized lenses with memories are certainly important for certain applications, and are typically very easy to compare and are available from the manufacturer’s specification sheets and many online reviews. What we could not find is any side-by-side, head-on comparisons that really compared picture quality. Hence, we undertook the comparisons as we were going to do it for ourselves and internal use, but thought others may be interested as well. The first comparisons we posted about, we compared the Sony VPL-VW365ES and the Optoma UHD65 without any calibration – as we purposely wanted to see how they compared. However, almost all of the feedback was about not being fair as the color was so different. We knew they would be closer if they were both calibrated but we were more interested in the contrast, brightness capability, and detail and resolution comparisons. Since then, we do a basic set up and calibration so that the differences you see in color are greatly reduced. We are also now doing some HDR comparisons, as with some of the laser projectors 4K HDR is beginning to be very exciting and dynamic, and in the right setting (dark room with medium-to-dark walls, ceiling, and floor), be quite spectacular with a well encoded and shot movie. These comparisons are not meant to be complete technical reviews (there are already lots of those online), but rather a way to see side-by-side images of two different projectors to help give you an idea of the differences and similarities of two different projectors relative to the image quality. TVS Pro has been involved with projectors since the first days of Kloss Novabeam projectors back in the 1970s. They were the very first practical series of home and professional projectors for video under $10,000. Since then, we have been involved with both professional and home theater projectors – giving us over 40 years of experience with them! From our customers’ standpoint, most are more concerned with cost and performance than the spec sheet or a comment on a blog or site by someone who has not seen the comparison in person nor spent hours with both projectors. Of course, some key features, including the warranty, are also important, but given two projectors in a similar category it usually comes down to price and performance. In the case of home theater projectors, good black levels, color accuracy and excellent contrast, along with needed brightness, are usually the key performance areas one uses to make a buying decision. (See our top 5 secrets blog for more information). We have noticed by the many questions and comments we’ve seen and have received that some readers just want to know which projector is best. As explained above, it is not that simple as it depends on so many factors and what combinations of settings are used, at what size a picture will be projected, the primary use, and the room environment. Even with a full ISF calibration, the grey scale tracking and color may be optimum with the settings used to do the calibration, but if a single setting is changed it can impact and alter the results dramatically. For example, if a calibration has been done in “reference” color mode and then the color mode is switched to say “bright” the performance is completely different. Likewise, if a dynamic contrast control is engaged it may change the black level of the deepest blacks and/or the change the contrast ratio extensively. In both of these projectors, for this comparison, they each have at least three different contrast menu items which all interact with each other. These are independent of a normal calibration and yet each of these settings interacts with, and affects, the contrast and ultimate black level of each projector. This explains why we are seeing such a wide range of opinions in many reviews. The challenge is they do not usually tell you what combination of settings they used for their evaluation. It is because of this interaction between settings that some reviews are saying the Optoma UHZ65 does not have very good black levels and yet others say it is very competitive with many of the best, which is it? The answer is, as we have discovered, it all depends on where you set the three key contrast and brightness settings. There are also similar, multiple controls for color and detail. In this review we will try and tell you what combinations of settings we used for the comparisons. It is important to understand that these combinations can and do affect the comparisons, and we have tried to put them in the most favorable and realistic modes for each projector. Hours upon hours and much testing is required to find these optimum settings – and in some cases it is still somewhat subjective as to which combination is better. We were excited to see the improvements in the new Sony projectors which were introduced at CEDIA 2017 in San Diego – the VPLVW385ES and VPLVW285ES. They, of course, looked great at the show but until we can really get our hands on them and make some comparisons it is almost impossible to tell just how good they can be. The good news is – yes, they are both improved (even the VPL-VW285ES at $4,999) and make better pictures than before, mainly by the improved lens – but we can say the images are definitely better. With the new lower prices we brought in the VPL-VW385ES ($7,999) as we wanted to compare the dynamic iris to the laser modulation of the Optoma. The key differences between the VPL-VW385ES and the VPL-VW285ES projectors, and really the only differences that we have been able to tell, is that the VPL-VW385ES adds the dynamic iris (better blacks and contrast) along with the lens memory for quick change for native 2:35 aspect ratio or two different screens. Although we used the VPL-VW385ES in this comparison, by turning off the iris, the image becomes the same as the VPL-VW285ES. Both Sony projectors are true 4K (4,096 X 2160) native resolution and use the 3-chip SXRD design. For these comparisons we put the Sony’s lamp mode in the “High” or brightest mode. Optoma’s UHZ65 projector uses the TI DLP single UHD rated chip (3040 X 2160) and a new laser light engine which, depending on the settings, is capable of modulating the laser to allow dynamic contrast and will even deliver complete true black when the IRE drops to 0 – like a fade to black. It also allows operation at the full rated output 3,000 lumens (Bright mode) with a very usable, but not highly accurate, color mode. This is very different than the Optoma UHD65 and UHD60 which go very green in their “Bright” mode and for most applications would be considered unusable in that mode. We have become familiar with, and now understand, the interaction of most, if not all, of the Optoma controls and used their optimum (in our opinion) settings for this comparison. Because we did not want the brightness and exposure to affect the perception and photo capture of the color, contrast, and black level comparisons, we usually had the UHZ65 at either 50% or 70% of its laser output. The setup with the Sony VPL-VW385ES/VPL-VW285ES on the left and the Optoma UHZ65 on the right. Black level, or the deepest level of no-light that a projector can do, is very important for home theater. There is no question that good blacks are an essential element to a high quality motion picture and video reproduction. Black in a projector is the absence of light, and yet the very next pixel may be 100% white or a very bright element of the scene – that is the challenge of contrast and blacks. Projector imaging chips, in this case DLP and a form of LCoS Sony calls SXRD, are the two very best (as of 2018) to get good contrast and blacks. Each has its advantages and disadvantages, so let’s take a closer look as there is much mis-information and confusion on this subject. To help understand the complexity of this, we will break it down into three types of black typically found in most movies and motion images. In this comparison keep in mind we are not only comparing the contrast capability of the chip, but also the light control for dynamic contrast and the effectiveness of the electronic contrast enhancement all working together. Optoma, in the UHZ65, uses a form of laser light modulation and electronic contrast control, whereas Sony is using a combination of a mechanical iris and electronic contrast circuits. Here is how they compare. When a scene fades to black or there is total black between a scene and it is measured on a waveform meter it is at a level of 0 IRE, or no visible light on an electronic display. There are actually levels of black below that (blacker than black), but you do not want to adjust to show those as the scene will then look washed out or flat. The Sony projectors compared here are using conventional UHP-type lamps which use an electrical arc, not a filament (hence the high cost), to light the image. The life of a UHP-type lamp is directly related to the number of times the lamp is started and the hours used. It is currently not practical to control the brightness of the lamp all the way down to 0 light, however it is possible for a laser light source projector to go completely off so no light is shown on the screen. This is an inherent advantage of laser projectors and some manufactures call this “infinite contrast,” but this is misleading as it does not relate to the actual contrast in an actual scene with any amount of light showing. 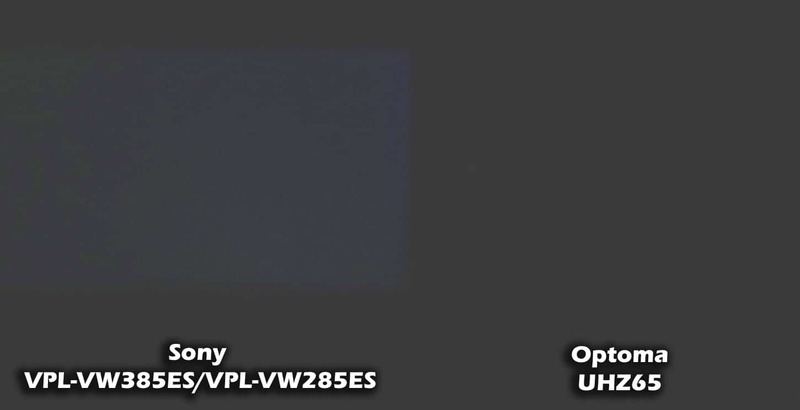 0 IRE- Pure black, Sony VPL-VW385ES on the left (near black), Optoma UHZ65 on the right (true black). Note: The above image is grossly overexposed and washed out to show the difference. Look closely, it’s there! The Sony VPL-VW385ES, with its dynamic iris and Contrast Enhancer circuit, can do very good blacks as you can see above, but of course, not as good as no light, which the Optoma can achieve with it’s Dynamic Black 3 and laser light control. This may not be a critical feature for some, but it is worth mentioning as it can be very interesting if your room is near completely black and you watch the opening of a movie like Disney’s Cars and the whole room goes from black to very bright and then back to black again. This is one that has mislead many of the reviewers as the out-of-the-box, or even calibrated, Optoma will not deliver its best blacks without many hours of testing and experimentation with the combinations of contrast and black level controls and their interaction with each other to get the very best blacks the UHZ65 can deliver. The Sony projectors, on the other hand, will deliver a very respectable out-of-the-box black level and contrast. Even though the Optoma can completely shut off all light, as shown above, as soon as you have even small white detail the blacks will be raised considerably in the default modes. The Sony projectors also raise up the black level, but do not go as high as the Optoma in its default settings. The next few images will give you some idea of what we have found. Please note the lettering is overexposed and not very sharp due to the very slow shutter speeds and high ISO’s used to capture the images. Before: Default settings will not give the best blacks out of either projector and in the case with the Optoma UHZ65 not very respectable black levels. This image is also greatly over exposed and pushed to show the black levels. After with 385ES: Both the VPL-VW385ES and UHZ65 optimized for best black level. Both projectors show much improved black level with the Sony still edging out the Optoma at this mix of mostly-black and very-little image. After with 285ES: Even more overexposed (look at the lettering) to show the VPL-285ES black level compared to the UHZ65. Notice the the 285ES, without a dynamic iris, is not quite as black as the 385ES (at least in person) but still slightly better than the Optoma on this almost-all-black image. This is where it gets really interesting. After all projectors were set for their very best blacks we looked at scenes with black and some level of image. What was very interesting was that now you are getting closer to what the chips themselves are capable of. If any amount of dynamic iris or laser dimming is used, then the brighter parts of the image are also reduced. This is now the contrast capability of the chips themselves. Keep in mind when it comes to the contrast of the chip itself and good black levels these are the two leading technologies. The transmissive LCD’s used in business projectors do not have anywhere near this level of contrast and good blacks. They do not need it as they are usually viewed in brightly lit rooms with high ambient light on matte white screens. They use brute force to achieve their level of contrast, but they are not great for home theater in controlled light as the pictures will look washed out in most cases. Both projectors are optimized for best blacks and contrast (over-30%-bright and semi-bright images). This tends to level the contrast differences. This image has also been pushed, or washed out, slightly to show both relative black levels. The Sony is at “High” lamp power and the Optoma is at 50%. Above is image of 385ES and we tested the 285ES on this scene and it looked identical to the 385ES as the iris is either completely off or not used. This may surprise many, as it did us. It would appear that on scenes with areas of brightness above about 20% or 30%, the two very different technologies and related circuits are very close. 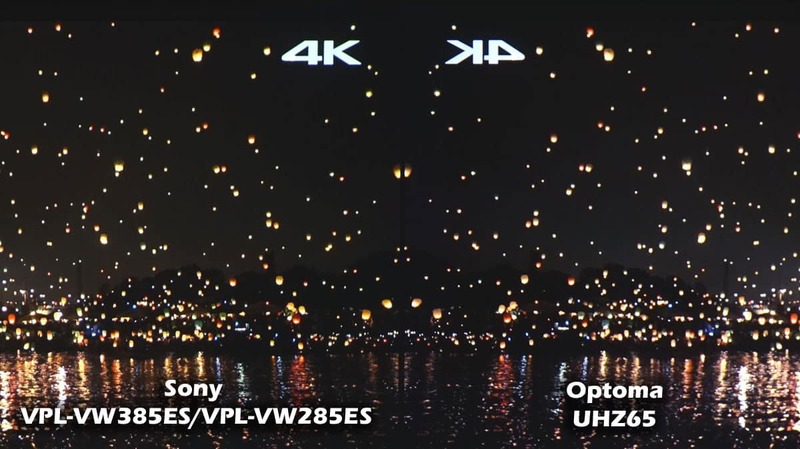 The Sony still edges out to the natural eye slightly better, but it is very close and needs to be seen on projectors that are both optimized for best contrast – which, in these examples, goes beyond just calibration. We also brought up the ANSI checker board which some feel is not a fair test as the white squares are 100% and the black squares are 0% IRE which is not very common in most scenes. It is however, a good indication of what kind of native contrast of the chip is possible. We are not set up to do a true ANSI contrast rating as our room has way too much light reflection in it but as you can see in the above image, and the one below, when there are both bright and dark areas of similar intensity they are both very close and very impressive. It then comes down to a scene-by-scene comparison with some scenes looking slightly better on one, and another scene looking slightly better on the other. They all have very good contrast and can deliver impressive contrast. It will be interesting to see the forthcoming firmware update on the Optoma to see if they can fine tune their laser dimming or modulation even further, as currently it is not quite as smooth or refined as the Sony dynamic iris on the 385ES. For example, when switching between inputs and the status information appears in the lower right, the black levels go way up and the status info is way way too bright. On the Sony projectors the dynamic iris on the 385ES and the Contrast Enhancer on the VPL-VW285ES seem to better handle the blacks during those changes. This image is slightly pushed to show black levels with slightly-zoomed-in crop. It is very impressive to see such completely different technologies both deliver such good contrast. VPL-385ES on left UHZ65 on the right. On this scene there was a slightly less black sky but still very close black on the 285ES which was too close to see any difference in a photograph. If you look closely at the white reflection in the water you will notice in the above images that the Sony at “High” lamp is just slightly brighter than the 50%-laser-power in the Optoma. We chose to keep the Optoma at 50% power to keep the blacks as close as possible. We recommend only using laser power settings above 50% if your screen size requires it (typically that would be larger than 150″ on a 16:9 screen, even for HDR 4K movies). Of course, good blacks and good contrast are only a part of what makes a great image, but in the case of these three projectors you will not be disappointed if they are properly set up and optimized. Here is a properly exposed scene with large black areas of space. This is the 385ES on the left with the UHZ65 on the right. When both projectors are set at optimum black levels by adjusting light source power, dynamic contrast settings (light source dimming), and contrast enhancer (electronic enhancement) settings, both projectors can produce very good contrast and black levels in most scenes. The accuracy of color and getting the most correct colors from a projector is derived from two basic areas. The first is the projector’s own unique and specific color capability, and the second is how well it is calibrated and set up. The ability of a projector to display the widest color gamut and most amazing color detail may be missed if it is not in an appropriate color mode, if the projector does not come with optimum factory settings, and/or if not set up properly. Fortunately, the projectors discussed here all have amazing and very good color capability compared to less expensive alternatives and is one of the reasons each is a leader in its respective class. For example, the Sony VPL-VW385ES, at just under $8K, is without question, in my opinion, the best full 4K (4,096 X 2160) projector currently in the market. On the other hand, the VPL-VW285ES is without question, in my opinion, the best full 4K projector under $5K, and the Optoma is the best, in my opinion, laser UHD 4K projector under $4,500. Since they are really in three different classes, let us see how they compare in color quality as they are all very popular and respected projectors. For the purposes of this comparison we will only show the Sony 385ES and UHZ65 as the 285ES is identical in terms of color reproduction (we were told this by Sony). Bars may be boring for many, but they tell us so much about the color accuracy of a projector. Both the Sony and Optoma are capable of near-perfect REC709 color, which is the standard for all HD content. Sony is at Full lamp power on the left, and the Optoma is at 50% laser power on the right. What we have found so interesting, in trying to show color comparisons online, is the super critical nature of our camera’s own white balance or color temperature. To the eye, in person, a few degrees below or above 6500 degrees is almost undetectable, and as anyone who has done calibration knows, there is usually a target in the calibration software that allows for a few degrees either way of 6500 – and it is still considered accurate. The reason is that sometimes a slight adjustment one way or the other of a projector’s control may put it either slightly higher or lower than “dead on” 6500 degrees, and the human eye seems to not be able to discern less than about a difference of 50 degrees or so. A color temperature of 6550 compared to a color temperature of 6500 side-by-side is not possible for most humans to tell a difference. The camera, however, is a different story. Let’s say we have two projectors and one is at 6450, and the other is at 6550 – both would be considered calibrated, but the camera may show one as slightly green and the other as slightly red. The eyes do not tell us this, but the camera sure does. Understanding this helps explain why trying to decide on a projector’s color quality from merely looking at images or videos is not a good practice. You can tell, however, if they are in the same ball park or class and would merit further consideration. Good skin tone is always a good thing to check when comparing color in projectors. Here, this slide from the Extron Projector Shootout Disc shows how realistic these projectors can be even though they use vastly different technologies. This image is used to evaluate good color saturation, accuracy, and color depth. Again, both projectors were excellent and no significant differences were noted. On this next image we will stress again that the differences you are seeing are so small that in person it did not look like it does here. Even so, they are again very respectable skin tones on each one, and to comprehend that we are seeing these on projectors with 4K capability at prices under $8K with this kind of color is amazing. This was not even possible 2 years ago. Notice the Sony menu below on the left side which indicates we are in the default 6500 (D65) with no calibration on our part, other than a very fine tweak in the Sony “Clear Color” adjustment to “medium” which brought the color temperature on this projector to center in the target. The slight difference in color is amplified by the white balance of the camera and is almost not discernible in person. 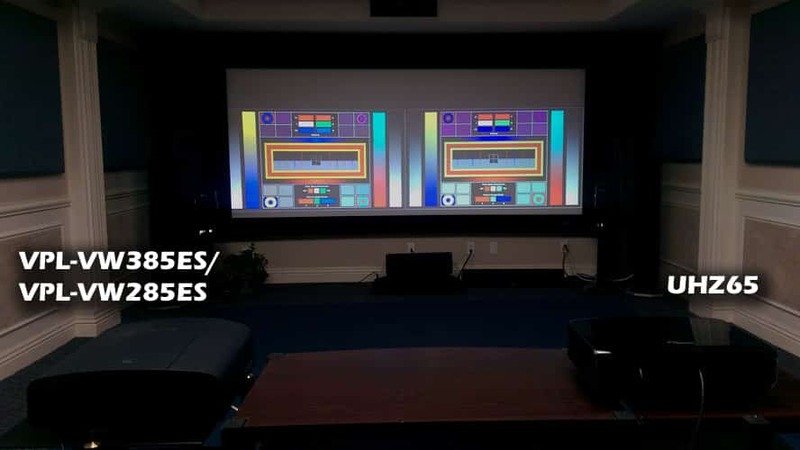 As far as a color comparison goes, the Sony projectors have the advantage of being essentially calibrated out-of-the-box, while the Optoma has the advantage of not having it change in color brightness intensity over time due to its laser. Most lamp-based projectors lose about 20-30% of their initial brightness in the first 200-300 hours, after which is very gradual over the balance of the life of the lamp. Lasers brightness do not fall off quickly like lamps, but have a very slow and gradual decrease in brightness over the life of the lasers. 20,000 hours on a laser is usually considered its half-life or half-brightness. That means that if we were to compare these same two projectors after, say 1,000 hours, the differences may be more visible. Sony even has an auto-color-circuit which re-calibrates the projector to help compensate for changes in lamp color temperature over time. As far as the extended color gamut used in the HDR specification (BT2020), we will discuss that in the HDR section later on. This entry was posted in AV Solutions, Home Theater and tagged optoma 4k projector, optoma laser projector, optoma uhz65, projector comparison, Sony 4k Projector, Sony projector, Sony projectors, Sony VPL-VW285ES, Sony VPL-VW385ES, Sony VPLVW285, Sony VPLVW385, uhz65, uhz65 comparison, vpl-285 comparison, vpl-vw385 comparison, VPL285ES, VPLVW386ES. Does the uhz-65 exhibit any noticeable rainbow effect? What test do you perform to identify this?